Historic Dundee on the Firth of Tay on the east coast of Scotland is having a renaissance after a tough period of change. 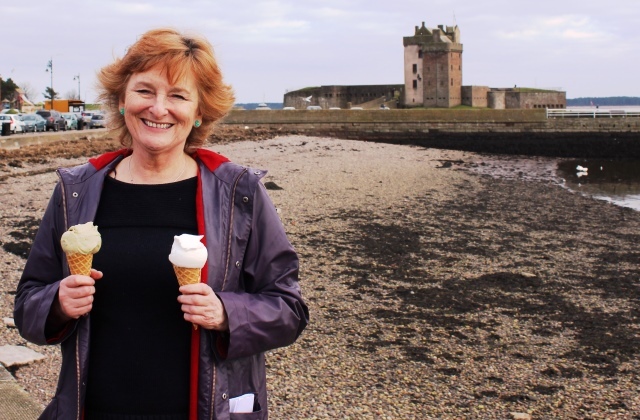 I’d only been to Dundee once before, in the 1990s, so when Visit Scotland invited me to return as part of Scotland’s Year of Food and Drink, I was interested what improvements had been made. 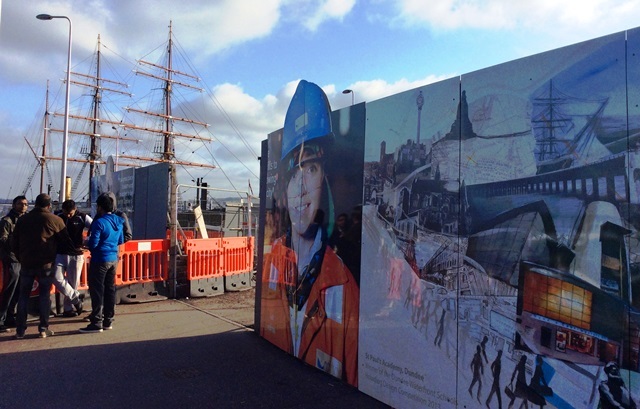 Dundee is the first UNESCO City of Design in the UK and in 2018 the new V&A Museum of Design is due to open. 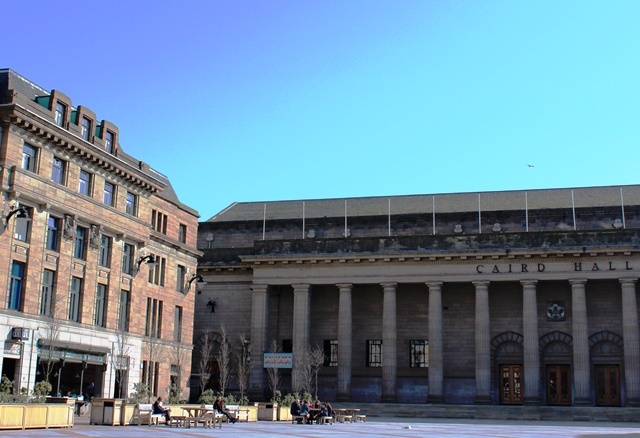 There are plenty of things to see and do, including the McManus Gallery, Jute Works Museum and fascinating Discovery Point, home to the ship in which Scott and crew explored the Antarctic. In the past, Scotland suffered from a rather poor reputation for food and dining experiences, but things are changing, as I discovered in tasty style during my weekend in Dundee. 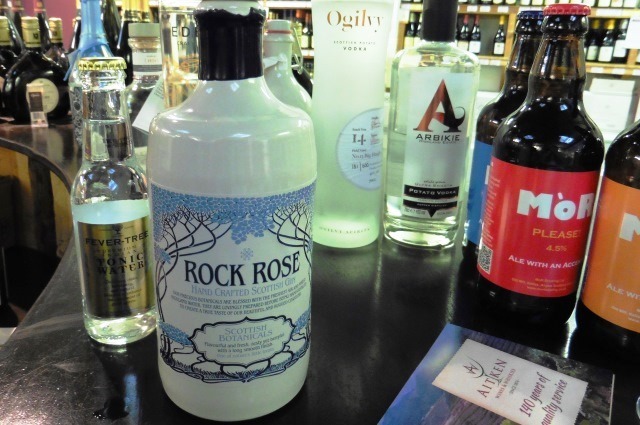 Aitken’s Wines, established in 1874, stocks an extensive selection of wines from around the world. 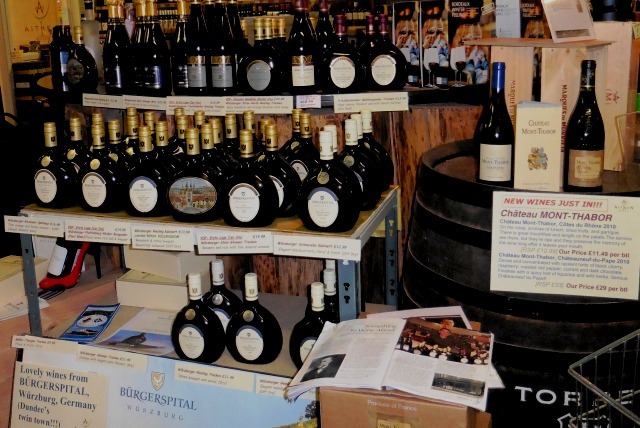 They import very special German wines from Bürgerspital in Würzberg, Dundee’s twin town. The pub, bar and restaurant scene is really thriving now. With two top-class universities and a reputation for world-beating medical and technology research, there is a young population, adding to its diversity. On Friday night I had dinner at the very popular D’Arcy Thompson with Dundee City PR Jennie Patterson. She explained that in the past few years the number of places to eat out has more than doubled and that the standard is really high. My starter of Arbroath Smokies, beautifully presented followed by Black Isle ribeye steak certainly set a very high standard. I loved the quirky surroundings of the bar. D’Arcy Wentworth Thompson was a Scottish biologist and mathematician whose writings on the mathematical beauty of nature influenced such diverse people as Alan Turing, Henry Moore and Jackson Pollock. The bar has an intriguing collection of memorabilia related to this famous Scot. 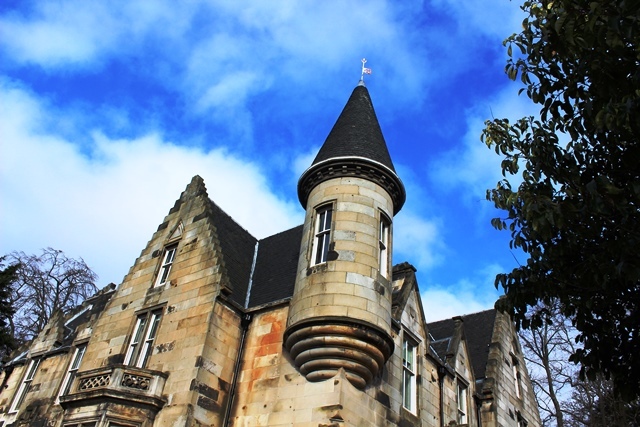 I stayed in comfortable luxury at elegant Taypark House, on the Perth Road, once one of the Jute Baron’s houses. The Eggs Benedict I had for breakfast was quite simply one of the best I have ever had. 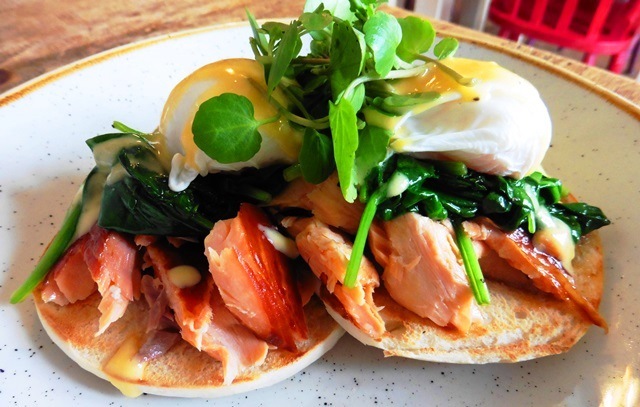 The poached eggs softly broke over the heaped pile of spinach, melting into delicious salmon chunks. With a bowl of fresh fruit and a big cup of strong coffee, a great way to start the day. 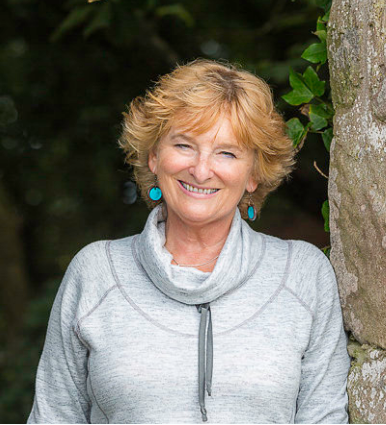 A burgeoning café culture is bringing in visitors from the neighbouring villages and towns, including pretty Newport and posh St Andrews. 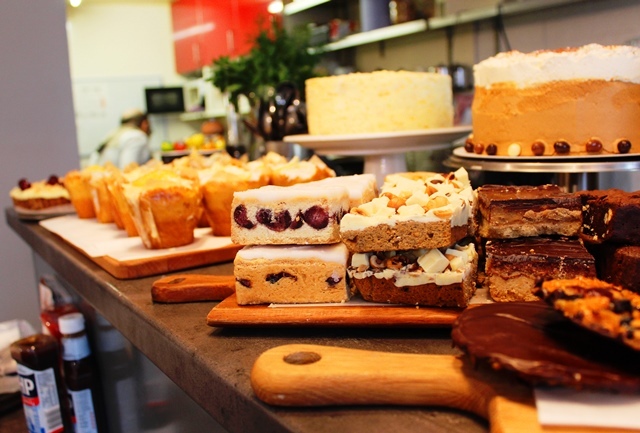 Jennie took me into quite a few but the one that gets my top vote has to be The Parlour Cafe. 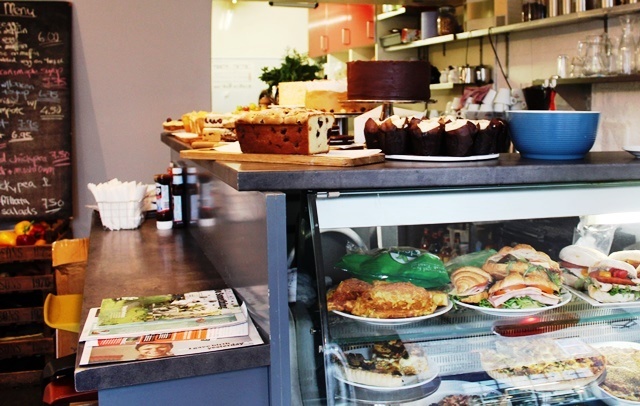 Situated just over the road from D’Arcy Thompson, it’s a (mainly) vegetarian café serving truly scrumptious cakes, rolls, biscuits, muffins and tarts and lots of other freshly made food. 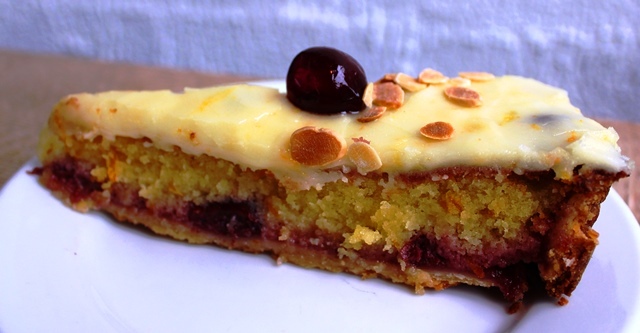 Jennie insisted I try the frangipane tart. 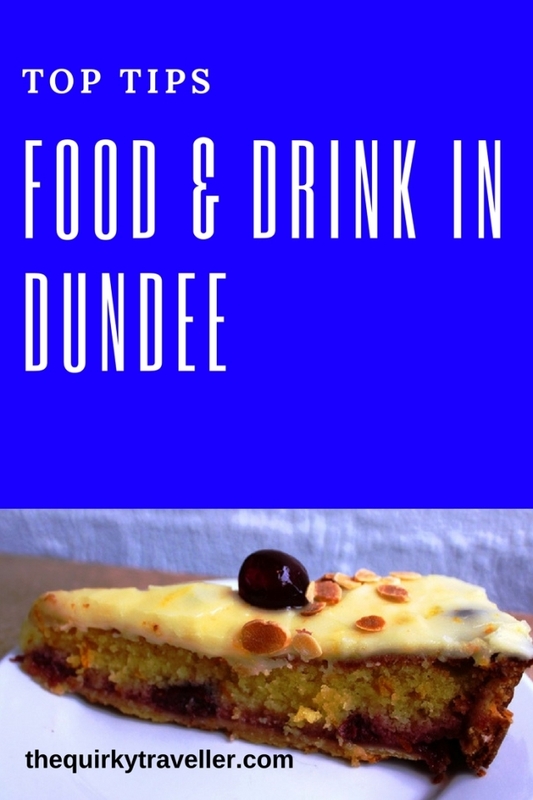 For a few moments I was in sublime foodie heaven – worth a visit to Dundee just for a slice of this meltingly divine treat! 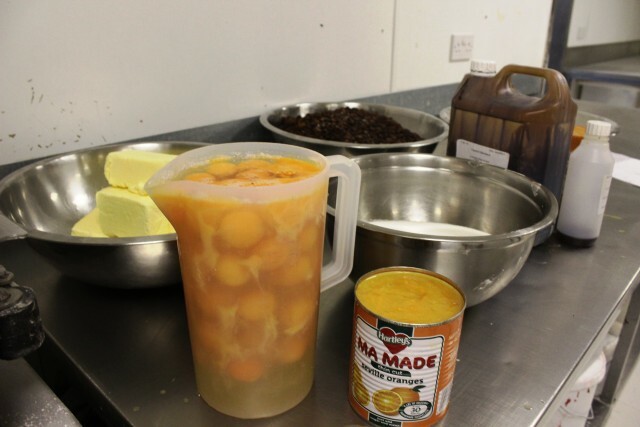 Alan used a small machine to mix the ingredients but it was placed into the tins by hand. 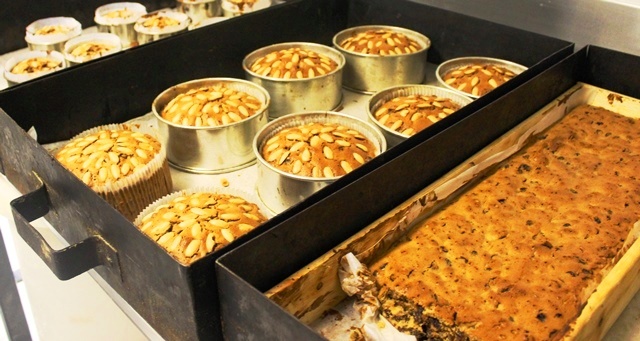 It was great fun getting hands-on to put the gloopy mixture into the tins and place the requisite almonds on top. The finished cakes looked, and tasted, delicious. They are sold locally and around the UK, whilst individual slices are packaged up for cruise ships. Saturday night out in Dundee provides plenty of eating and drinking choices. I went to the Italian Grill on the City Square, not far from the statue of Desperate Dan and Mini the Minx. DC Thompson & Co Ltd, creators of the Dandy, Beano, Bunty and many more magazines, is based here. The lively restaurant offers a wide range of Italian and Continental food with friendly service and birthday sparklers. I enjoyed the seafood linguine and amaretto cheesecake. There’s also outdoor seating for balmy nights and sunny days. 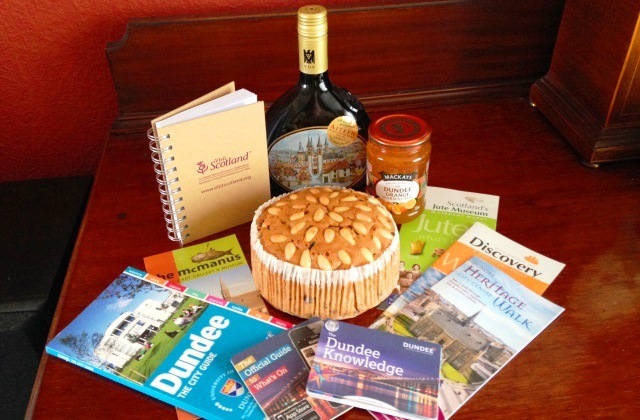 A short drive from Dundee centre is Broughty Ferry, an attractive village on the banks of the River Tay, with good eateries and pubs including the Anchor Bar, Ship Inn and Sol y Sombra Tapas Bar. 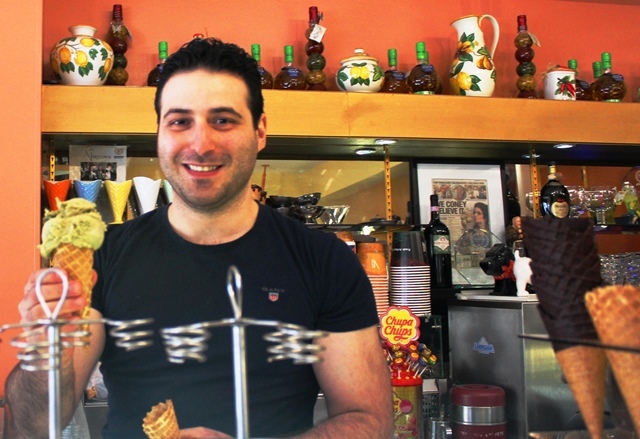 After a quick drink in the quaint Fisherman’s Tavern, Jennie and I met Marco Caira at Visocchi’s, an Italian ice cream parlour and café here since 1954. Of course we had to have an ice cream. Spoilt for choice, I went for Marco’s recommendation of their award-winning pistachio flavour, made with real nuts and Jennie chose limoncello. We ate them on the riverside, overlooking Broughty Castle. On my final night at Tay Park House, I relaxed in the lounge with a wee dram. I was recommended to try the Balvenie, a 12 year old single malt whisky which went down a treat. As I relaxed in front of their cosy fire in the warmth of the lounge, I reflected on the varied and flavoursome food and drink I’d had during my visit. 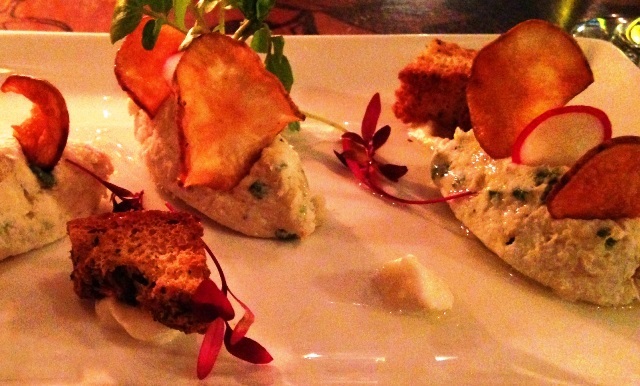 There’s absolutely no doubt it – Dundee is well and truly on the foodie map. Many thanks to Visit Scotland for hosting me in Dundee, Jennie Patterson for showing me round and sharing her passion for the city, the owners and staff at Tay Park House for their hospitality and Dundee City for a great taste of Scotland! Looks like this city has changed a great deal in the past few years! Knew the ‘Discovery’ was there but not about the Jute Industry. I remember a bakery similar to Clarks when I was growing up in Scotland, but this one looks like it’s modernised a lot. Time to return and have another look at Dundee I think. Yes, you’re right John, it’s a very different city from a few years ago and has a vibrant buzzy feel to it. Definitely go back and see what’s changed!